I was asked by a colleague of mine if I knew of any diagrams that showed the various properties etc of Flex and ActionScript classes. 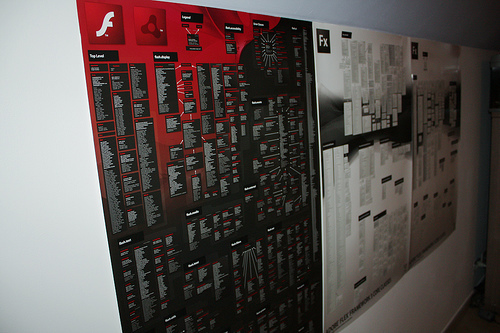 Now I remembered the posters that came out for Flex 2 and thought I’d google to see if there were any updated PDFs for Flex 3. To my surprise I found out there were some really cool posters (no PDFs though); I did find some images of them on Flickr (photo taken by Sarah DeForche) however, there was no information on where to get them from. After asking a few of my Adobe friends, Mike Potter came to the rescue and pointed me to this page (Note you need to have an Adobe ID and a valid Flex 3 serial number to order them). For the record this link is also on Flex.org but it’s a bit tricky to spot (about two thirds of the way down the page on the left). It does not look tricky to find the checkbox option for free posters. I have my long ago. After all, registering info is something we have to look through all details right?